You will find below the horoscope of Nathalie Renoux with her interactive chart, an excerpt of her astrological portrait and her planetary dominants. Horoscopes having the same aspect Venus opposite Uranus (orb 1°49'): Sharon Stone, Robert Pattinson, Ellen DeGeneres, Romy Schneider, Miranda Kerr, Jimmy Page, Michel Sardou, Benicio Del Toro, Daniel Balavoine, Bobby Brown, Charles Bukowski, Guillaume Canet... Find all the celebrities having this aspect. Horoscopes having the same aspect Venus opposite Ascendant (orb 2°03'): Nelson Mandela, Muhammad Ali, Michael Jordan, Russell Brand, Jimmy Fallon, Michelle Williams, Kate Bosworth, Booba (rapper), Laura Smet, Mireille Mathieu, Samuel Beckett, Kenny Chesney... Find all the celebrities having this aspect. Celebrities clicked on in real-time: 576,704,090 times. Nathalie Renoux, born May 3, 1971 in Angers (birth time source: Astrotheme, civil registrar, acte n° 1962), is a French journalist and TV host. Here are some character traits from Nathalie Renoux's birth chart. This description is far from being comprehensive but it can shed light on his/her personality, which is still interesting for professional astrologers or astrology lovers. 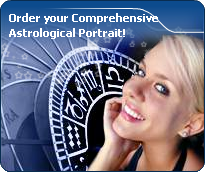 In a matter of minutes, you can get at your email address your astrological portrait (approximately 32 pages), a much more comprehensive report than this portrait of Nathalie Renoux. Nathalie Renoux, the nocturnal North-western quadrant, consisting of the 4th, 5th and 6th houses, prevails in your chart: this sector favours creativity, conception and some sort of specialization or training, with helpfulness and relations as strong components. You need others' cooperation in order to work properly, although you are not very expansive: creating, innovating and thinking are what matter most to you because this self-expression enriches you and totally satisfies you. Nathalie Renoux, Fire is dominant in your natal chart and endows you with intuition, energy, courage, self-confidence, and enthusiasm! You are inclined to be passionate, you assert your willpower, you move forward, and come hell or high water, you achieve your dreams and your goals. The relative weakness of this element is the difficulty to step back or a kind of boldness that may prompt you to do foolish things. Like the majority of Earth signs, Nathalie Renoux, you are efficient, concrete and not too emotional. What matters to you is what you see: you judge the tree by its fruits. Your ideas keep changing, words disappear, but actions and their consequences are visible and remain. Express your sensitivity, even if it means revealing your vulnerability. Emotions, energy and communication must not be neglected; concrete action is meaningless if it is not justified by your heart, your intellect or your enthusiasm. Nathalie Renoux, the Cardinal mode is dominant here and indicates a predisposition to action, and more exactly, to impulsion and to undertake: you are very keen to implement the plans you have in mind, to get things going and to create them. This is the most important aspect that inspires enthusiasm and adrenalin in you, without which you can grow weary rapidly. You are individualistic (maybe too much?) and assertive. You let others strengthen and improve the constructions which you built with fervour. The emphasis is on succedent houses in your chart, namely, the 2nd, 5th, 8th and 11th houses, Nathalie Renoux: this configuration usually endows a personality with affective and sensitive qualities. Obviously, to the detriment of self-confidence or self-assertion, but your heart qualities may be very important. These houses also favour realization. Time and patience are part of their characteristics. However, they are only indications and you must include them in the rest of your chart in order to see whether they are validated or not! The 6th, 8th and 12th houses are the most prominent ones in your birth chart. From the analysis of the most tenanted houses, the astrologer identifies your most significant fields or spheres of activity. They deal with what you are experiencing - or what you will be brought to experience one day - or they deal with your inner motivations. After this paragraph about dominant planets, of Nathalie Renoux, here are the character traits that you must read more carefully than the previous texts since they are very specific: the texts about dominant planets only give background information about the personality and remain quite general: they emphasize or, on the contrary, mitigate different particularities or facets of a personality. A human being is a complex whole and only bodies of texts can attempt to successfully figure out all the finer points. Love at first sight, flash in the pan, amorous impulsiveness? All these are part of your way of loving or to fall in love, Nathalie Renoux. Throughout your relationship, you maintain this kind of jerky and lively style, that may seem childish or naïve, but that is so generous and cheerful! You are undeniably possessive and you are not concerned with your partner's opinion but, fortunately, you readily forgive because of your spontaneity and your authenticity. When your relationship is intense, everything is fine. There is no romanticism, no complications with you. You love with ardour and, except for a few crazes and opportunities for new pastures here and there, the only danger may be that boredom settles in. In that case, you leave without regret and you quickly forget what consumed you, not so long ago. The ruler of the Ascendant, Nathalie Renoux, is Venus. It is located in Aries and adds a note of rapidity and impulsiveness into your chart. You have a spontaneous and enterprising side which prompts you to take action quickly and to be a pioneer. However, as a consequence of this refreshing impetuosity, you may get bored quite quickly and move on to something else if you lose your enthusiasm. Nathalie Renoux, you are so resistant and so solid that you are able to cope with any challenge, any ordeal. You behave with persistence, rigour and discipline. You are so obstinate and patient that no effort is impossible to you, as if sensitivity and emotions were unable to divert you from your goals. With calm and lucidity, even coldness, you face up to things and you plan on a long-term basis. Nothing and no one can prevent you from fulfilling your responsibilities. You are a rock, a hard worker, and your iron will equals your resistance to blows. Your practical sense is at the service of your ambition which is real and energetic, even though it may not be obvious. Sexually, you are active and vigorous. If you show more warmth, you may become an excellent lover; indeed, being demonstrative is not your major concern. This text is only an excerpt from of Nathalie Renoux's portrait. We hope that it will arouse your curiosity, and that it will prompt you to deepen your knowledge of astrology, as well as to visit and use the wide range of free applications at www.astrotheme.com.